Listen up Dallas/Fort Worth – to celebrate the launch of Taco Cabana’s month-long fundraiser, Taco Treat, to benefit the Warrior and Family Support Center in San Antonio, the brand will offer guests one FREE Chicken Fajita Taco from 4 – 7 p.m. on Oct. 1. FREE giveaways available at participating restaurants while supplies last and no purchase is necessary to receive the taco. Throughout October, Taco Cabana customers can help raise money for the WFSC by purchasing $1 coupon books, which include five FREE bean and cheese taco coupons, and 100 percent of the proceeds go to the WFSC. 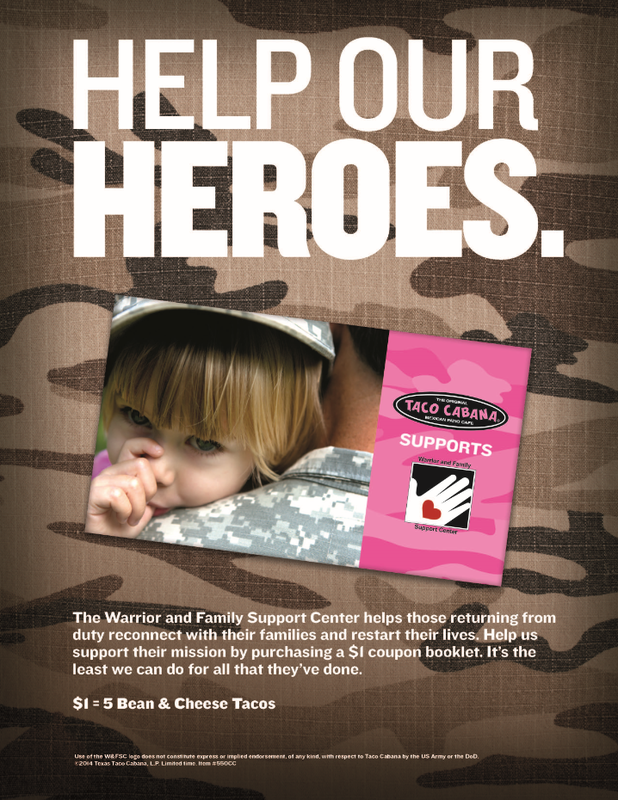 Taco Cabana® brings back its popular Taco Treat fundraiser this October to benefit the Warrior and Family Support Center (WFSC) at Brooke Army Medical Center in San Antonio. All Taco Cabana locations in Texas, Oklahoma and New Mexico will sell $1 coupon books good for five free bean and cheese tacos, with 100 percent of the proceeds going to WFSC. To kick off this year’s fundraiser, Taco Cabana is also offering its guests one free Chicken Fajita Taco on Wednesday, Oct. 1 from 4 to 7 p.m. in anticipation of National Taco Day. No purchase or coupon is necessary to get the free taco and Taco Cabana will offer this special while supplies last. The WFSC is dedicated to providing coordinated services to patients, next-of-kin and extended family members with a primary focus on wounded Operation Iraqi Freedom and Operation Enduring Freedom veterans. The center provides a relaxing entertainment environment for veterans receiving treatment at the Brooke Army Medical Center and their families. WFSC also puts on special camps for the children of wounded veterans in both the summer and winter. In addition, the WFSC provides vital family necessities including diapers, formula and food during times of great need and transition.